I've become obsessed with fair-isle knitting, particularly using a solid and a varigated yarn, rather than two solids. I blame Natalie and Jane for this, mostly. Well, that, and I had no idea what else to do with rainbow yarn that's likely to be too busy for anything other than stockinette, and maybe too loud for even that. 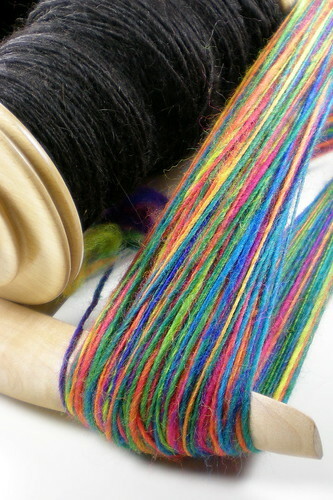 Luckily, I remembered that Nikki bought me some black alpaca for my birthday last year (on condition that I use it for something for me), so I dug it out and spun it up (it was lovely), and hopefully, there'll be enough of both to make a pair of wristwarmers. Now though, the fun part - making up the chart!